UN Secretary General Antonio Guterres, who was received Tuesday in Rabat by King Mohammed VI, commended the constructive role played by Morocco in boosting South-South cooperation based on solidarity and shared interests. Mr. Guterres arrived on Sunday in Marrakech to take part in the UN conference on migration marked by the adoption of the first ever-global agreement pledging to ensure a safe, orderly and regular migration. 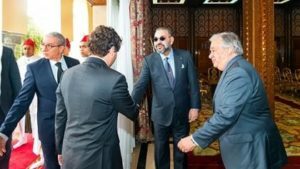 After the closing ceremony of the UN conference, King Mohammed VI welcomed the UN Secretary General who thanked the Sovereign for the “successful organization” in Morocco of the Global Compact on Migration (GCM) crowned with the adoption of the “Marrakech Pact”, says a statement issued by the Royal Office. On this occasion, Mr. Guterres praised Morocco’s South-South cooperation, human rights achievements, the implementation of the 2030 agenda for sustainable development & climate change, added the statement. The UN chief also lauded the country’s contributions and steadfast commitment to peacekeeping operations, particularly in the Democratic Republic of Congo and the Central African Republic. Talks between Mr. Guterres and the Moroccan Monarch also covered the situation in the Maghreb region, Africa and the Sahara issue in the light of the 1st round-table meeting held in Geneva Dec. 5-6. King Mohammed VI availed this opportunity to reaffirm Morocco’s firm support to the efforts made by the UN Secretary General and his personal envoy to reach a final political solution to the Sahara regional dispute. Written by: Jaber Ali on December 12, 2018. Posted by Jaber Ali on Dec 12 2018. Filed under Headlines, World News. You can follow any responses to this entry through the RSS 2.0. Both comments and pings are currently closed.